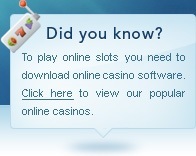 If you're looking to contact us here at SlotsOnline.com then we welcome you to use the contact form on this page. Please make sure that you fill out this form correctly so that we can contact you and reply to your enquiry. This contact form should not be used to ask support questions regarding advertisers on our website, we are unable to help with enquiries of this nature and ask you to contact the advertiser directly.